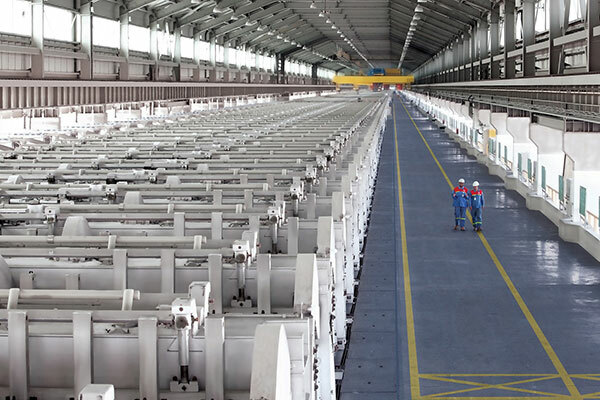 The aluminium sector’s total contribution to the UAE’s national economy was estimated at Dh20 billion ($5.4 billion) in 2017, or 1.4 per cent of the country’s total GDP, a media report said. The sector also supported 60,950 UAE jobs in 2017. One in every 100 people working in the UAE is employed in the aluminium sector, its supply chain, or through spending of wages by the sector’s employees, reported Emirates news agency Wam, citing an expert study. EGA sells approximately 10 per cent of its production to 26 local companies that make products using its metal, from car parts to window frames. The rest of EGA’s production is exported to more than 60 other countries. The study was conducted by Oxford Economics, an international economics consultancy, based on data supplied by companies in the sector and established economic models. Oxford Economics calculated the economic impact of EGA by analysing three types of activity. ‘Direct impact’ is the value of EGA’s own activity and that of the UAE companies that make products using EGA’s metal. ‘Indirect impact’ is activity stimulated by the sector’s purchase of goods and services from UAE suppliers. ‘Induced impact’ is the spending of wages earned by workers in the sector in the UAE economy, such as on housing and leisure. Every Dh1 generated in the aluminium sector was found to create an additional Dh0.26 of activity elsewhere in the economy. Economists call this the ‘multiplier effect’. In 2017, the company spent almost Dh10.6 billion ($2.9 billion) on energy, raw materials, and goods and services from other companies in the UAE, while EGA’s local customers are estimated to have spent a further Dh940 million ($260 million). More than 38,000 people worked in the aluminium sector’s supply chain, in industries including natural resources and utilities, construction, transport, and financial services. The aluminium sector directly employed over 10,000 people in the UAE in 2017: 72 per cent of whom were employed directly by EGA. Average total employment costs per worker in the aluminium sector are more than double the UAE average, reflecting the high skill level of the workforce. The aluminium sector’s ‘induced impact’ – economic activity from the spending of wages earned in the sector – was Dh1.7 billion ($460 million) in 2017. The industries benefiting most significantly were real estate, utilities, retail and financial services and spending by aluminium sector workers supported more than 12,700 UAE jobs. Commenting on the results, Sultan bin Saeed Al Mansoori, Minister of Economy, said, "The UAE is proud of the leading national institutions it currently boasts across a number of vital sectors – chief amongst them the aluminium sector, which has contributed to the reputation and economic competitiveness the country enjoys on both the regional and international stage. The UAE today is considered one of the world’s largest exporters of this resource – one that is critical to a number of other sectors such as aviation, shipping and construction. "EGA is a leading company in the sector globally, and has contributed to the positive reputation our country’s economy enjoys in foreign markets, in addition to playing a significant role in local skills development, knowledge transfer, and the creation of economic opportunities across the supply chain," he added. Al Mansoori noted that the ministry has been working on developing the country’s competitiveness by focusing on economic strategies that diversify sources of income, and drive sustainable growth across a number of industries in order to create job opportunities, develop local capability, and encourage innovation. He added that aluminium’s total contribution, be it direct or indirect, was estimated at Dh20 billion in 2017, or 1.4 per cent of the country’s total GDP. Abdulla Kalban, managing director and CEO of Emirates Global Aluminium, said, "EGA is a global company anchored in the UAE with strong commitment to excellence, sustainability and healthy growth. Our demand for goods and services has led to the development of a competitive supply chain around us, and others have founded successful businesses making products from our metal." Emirates Global Aluminium, which began production as Dubai Aluminium, in 1979, is now one of the largest aluminium companies in the world and is at the centre of a key UAE industrial sector.